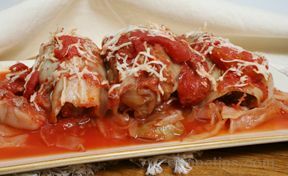 Like a cabbage roll, this dinner will please all you cabbage lovers. 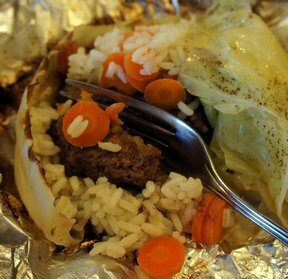 Buttery and seasoned with salt and pepper, the cabbage is delicious along with added all that flavor to the hamburger. Mix meat with garlic salt, pepper, egg, 1/2 of tomato sauce and crackers. 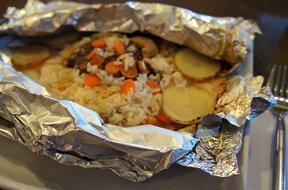 Cut and place 8 aluminum foil strips on a baking dish, so foils do not touch. Add 3 oz of beef mixture to center of each foil sheet. Place vegetables and rice around meat. Fold corners to center and roll down. Bake at 350 degrees F for 45 minutes. 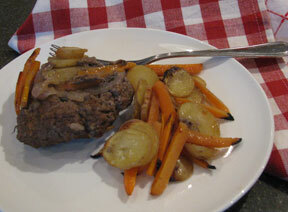 Inside temperature of meat should be 165 degrees F.
"I grilled these on medium heat for 20 minutes and it was perfect. The cabbage was by far the best part."